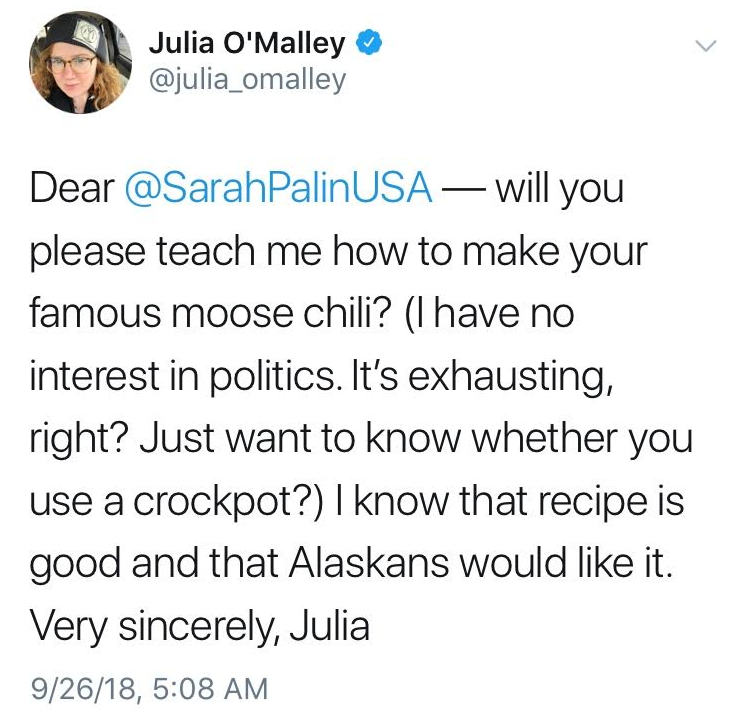 In case you didn’t hear, Sarah Palin is planning on leaving Alaska to, “get outside and do more.” Food blogger, journalist, and Alaska Instagrammer extraordinaire, Julia O’Malley, has kindly asked former Governor Palin for a parting gift. Somebody please make this happen. Can the Stalker come, too? 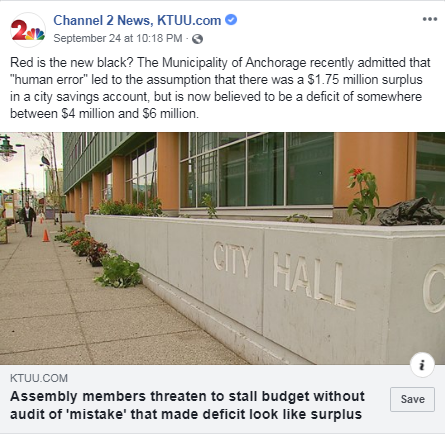 This was a clear front runner for “funniest thing we saw on the internet all week.” Maybe Senator Dunleavy was on to something when he said, “And Begich skipped the last four years of discussion.” We are pretty bummed they turned off the comments. 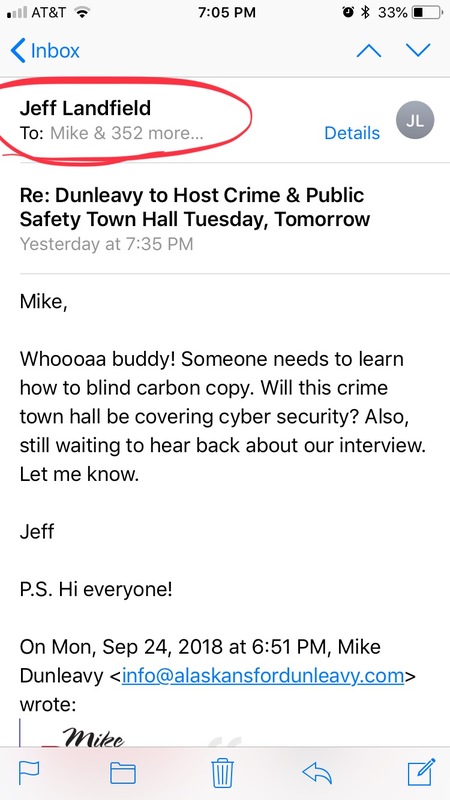 Then this happened: on Monday, Senator Mike Dunleavy sent out an invite to his crime town hall (more on that later). Problem was “Mike” forgot to bcc more than 350 recipients. YIKES! Even bigger problem–Jeff Landfield was one of the email’s recipients. YAAASSSS! 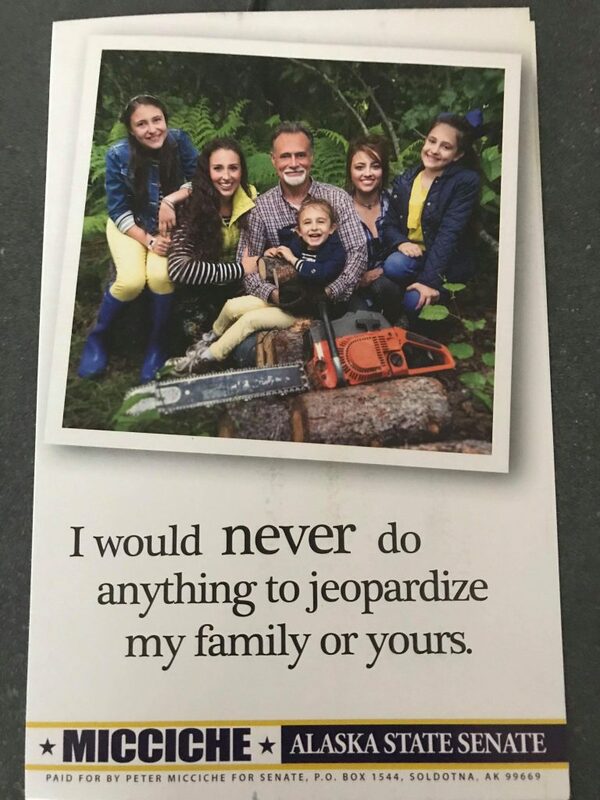 Of course, Jeff replied all. We cannot stop laughing. P.S. Hi everyone! 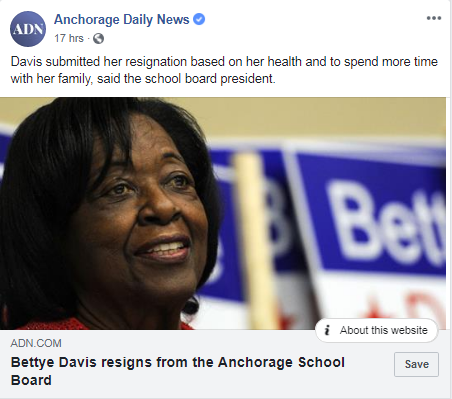 Former Senator Bettye Davis announced her resignation from the Anchorage School Board. 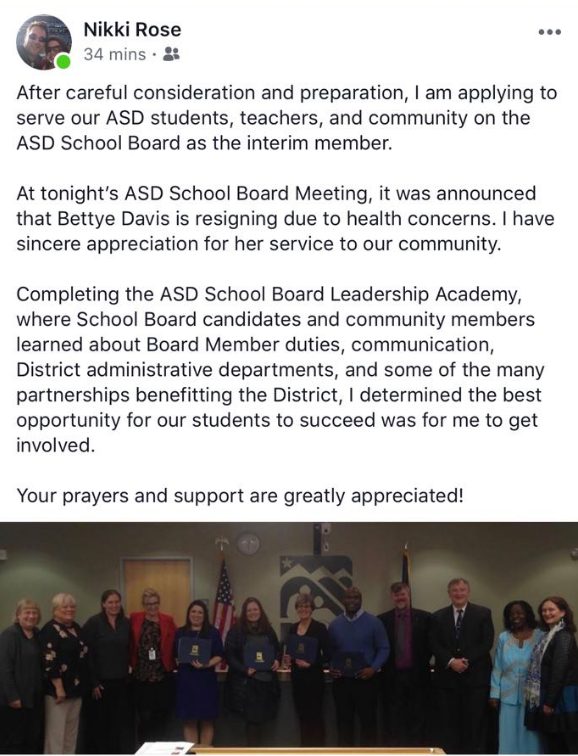 This means a new board member will be selected via the school board by a majority vote. She’s baaaaack! Don’t say we didn’t warn you. 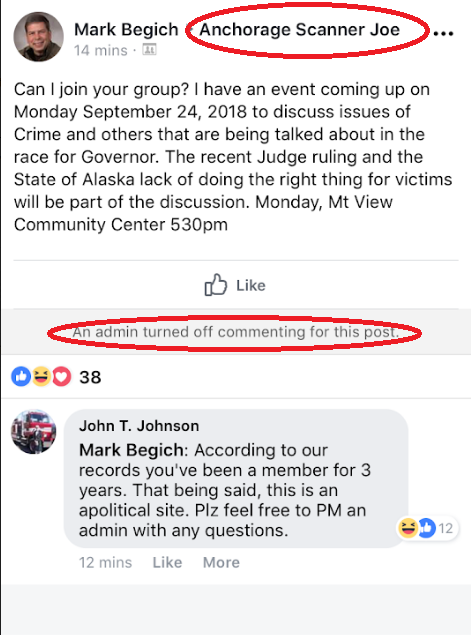 The ADN’s only GOAT conservative columnist is not a fan of the Anchorage Assembly plastic bag ban. Andy’s recent Facebook rant called attention to how the ban is hurting small businesses. The internet gods must have been smiling upon him, because later that day he came across a reusable bag stuck in the bushes along Chester Creek. 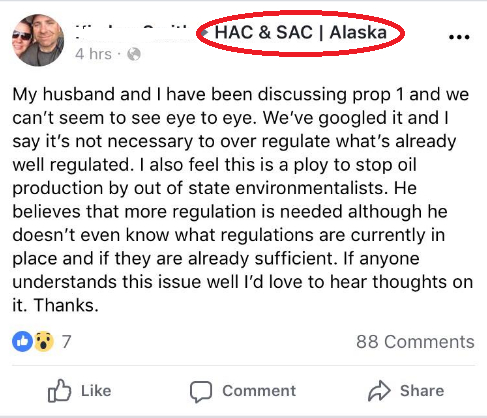 Part of me hopes the wife neglected to tell her husband exactly what the Facebook group HAC & SAC is. What an epic strategy to solve marital disagreements! That poor guy. For those of you who don’t know, HAC & SAC is about as neutral as a Must Read Alaska poll. Now on to the gubernatorial race. Last Thursday the NAACP held a candidate forum for all four candidates. Another thank you and shout out to Matt Buxton for live tweeting these things so we don’t have to go. 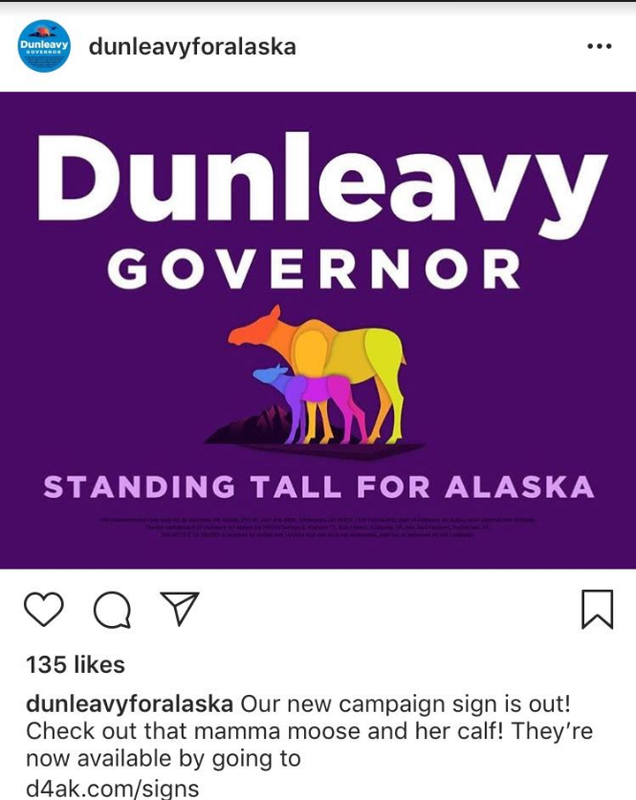 Like last time, Senator Dunleavy decided to campaign elsewhere. 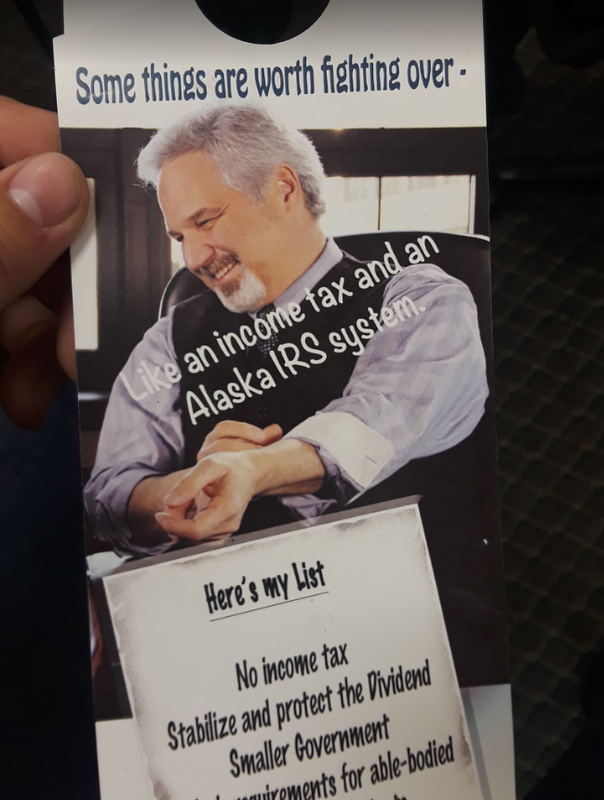 #WheresMike is now officially a “thing” on Alaska Twitter. 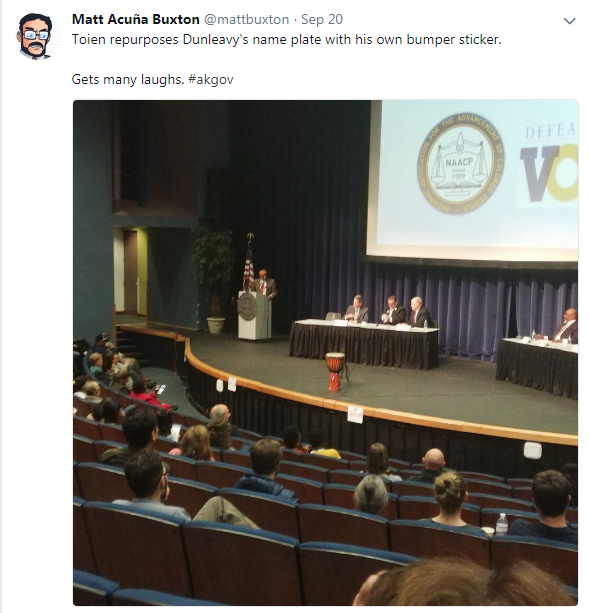 Governor Walker even used his one question to troll Dunleavy in his absence. Unlike last time, Senator Begich’s paid staff Twitter cheerleaders must have been off the clock. 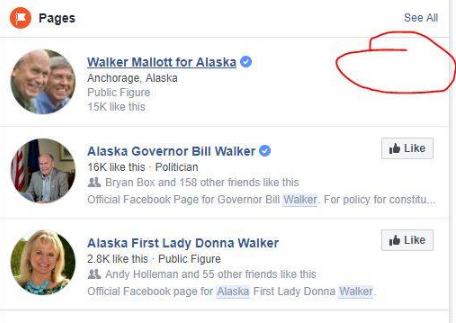 Governor Walker’s head cheerleader, Press Secretary Austin Baird, showed up and weighed in on Begich’s thread. 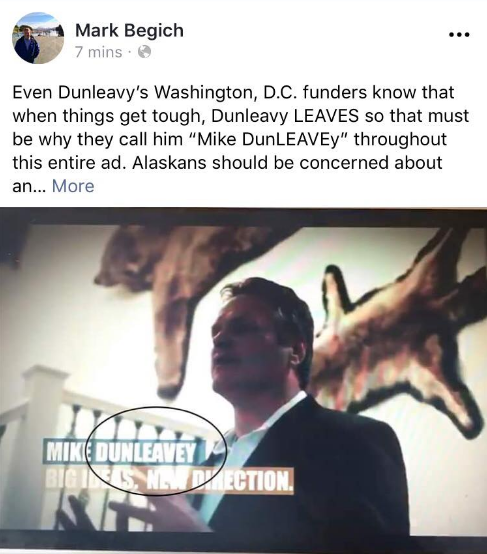 From what we’ve seen, Dunleavy doesn’t have any Twitter cheerleaders to speak of. Except maybe @radiostieren. And because the Stalker believes in fairness here’s something about the fourth gubernatorial candidate, Libertarian Billy Toien. 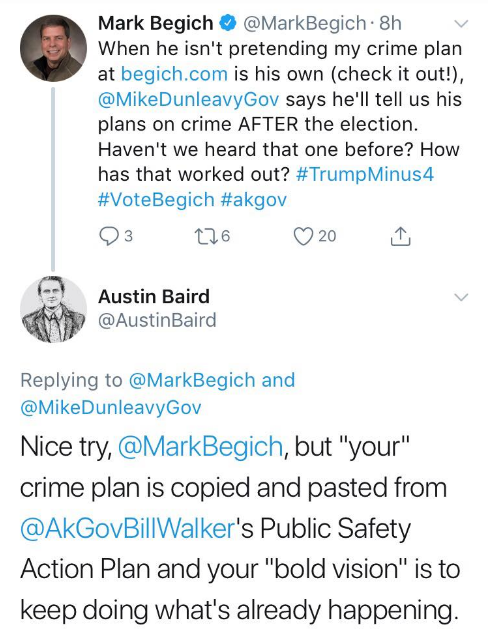 Continuing with the #WheresMike momentum, Senator Mark Begich threw some clever shade at his opponent after this great Stalkeresque find. Pro tip Mark: we prefer a red circle. It’s more eye catching. 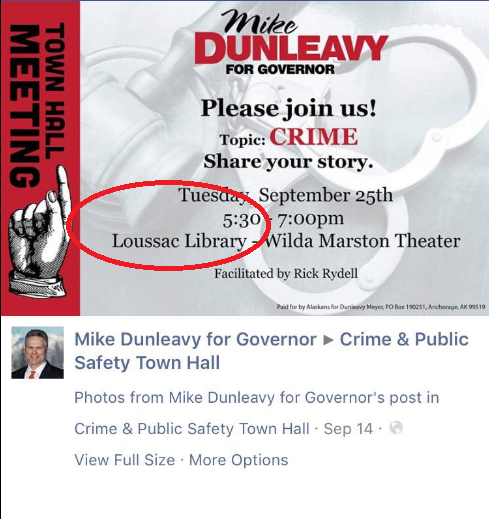 Senator Mike Dunleavy held a crime town hall last night. I won’t make the obvious joke of asking if he showed up. Instead I’ll note I was interested in attending, but decided to pass after noting the location. The Loussac Library is too dangerous these days. Don’t believe me? In 2017 the police were called there 210 times. That’s over 60% of the days the library was open! Haven’t heard much about Mike’s crime town hall yet. But where I live things are getting pretty bad. Is stealing raw chicken the next big thing? 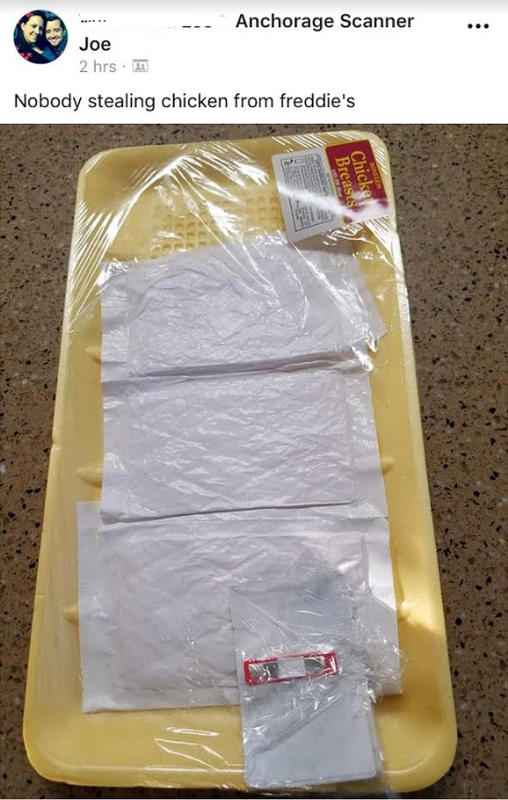 At least the Anchorage Assembly hasn’t banned those plastic bags in the meat department. How considerate to the criminals. Want to know what the top video is when you search congressional candidate, Alyse Galvin, on YouTube? Check this out. It’s pretty weird. Morning conservative talk radio show host and self proclaimed fiscal conservative, Rick Rydell, is not exactly practicing what he preaches. While I don’t know the exact purchase price, it sounds like his mortgage might be pretty reasonable. 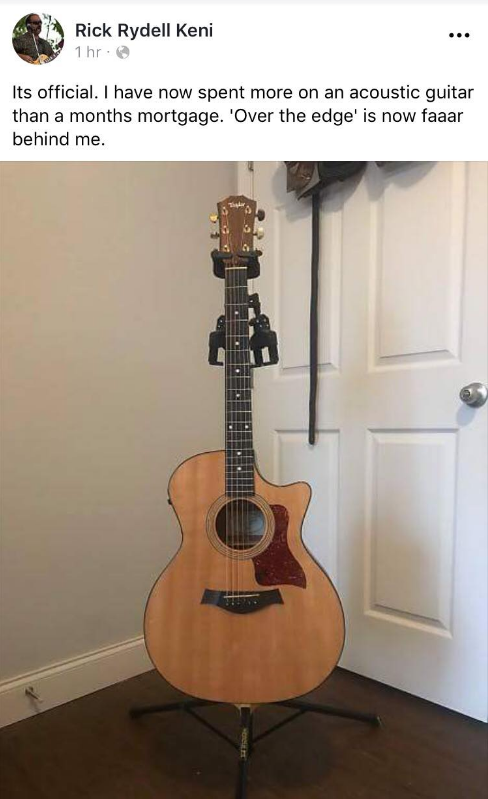 I mean, it’s not even a Martin. I’m no expert, but something tells me his mortgage is about to get a hell of a lot larger. Seriously though, why am I not seeing everyone talking about this online? Seems like a big story. 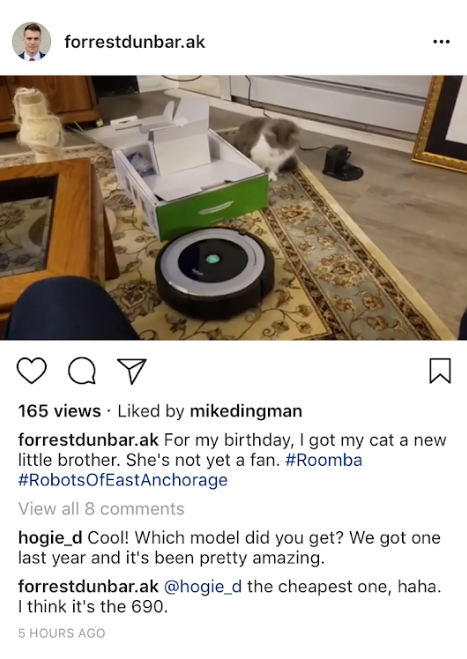 Another big spender, Assemblymember Forrest Dunbar, recently purchased a Roomba for his birthday. While his cat doesn’t seemed thrilled, we are pleased to see Forrest stimulating the economy. I sure hope he bought it locally! 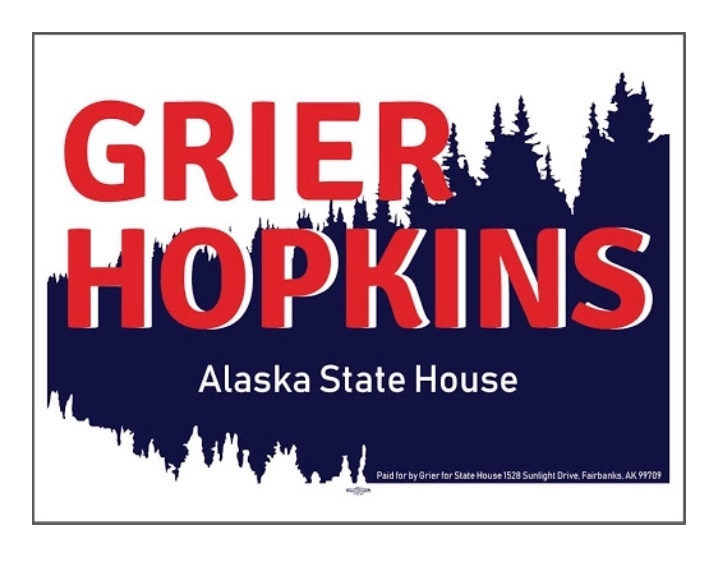 Speaking of Forrest, check out this special message from the The Great Alaskan Bush Company to Assemblymember Forrest Dunbar. 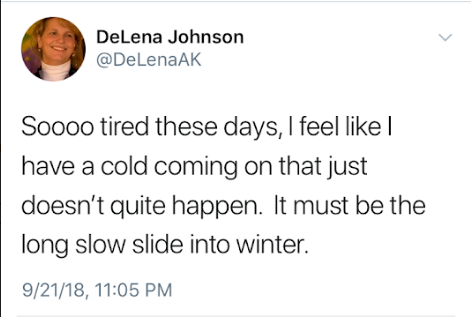 We highly recommend following Representative DeLena Johnson on Twitter. 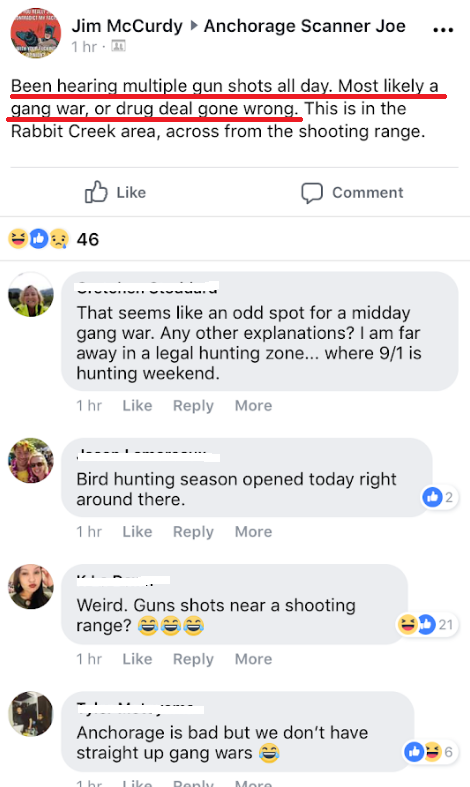 We often have no idea what she’s even talking about, but it’s pretty funny. DeLena, maybe you should join Rick and Forrest and drop some serious cash on a SAD lamp. 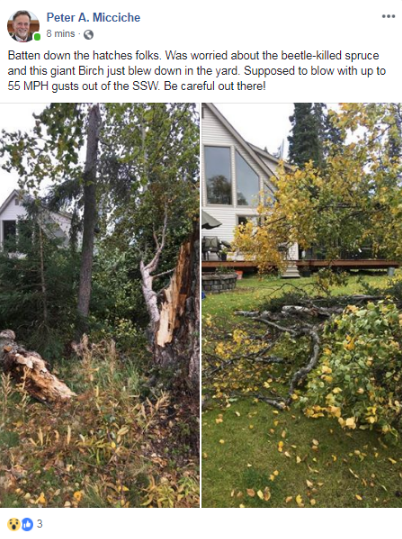 Senator Peter Micciche was also a victim of the recent Southcentral fall windstorm. Things are starting to get getting even more nasty on the Peninsula. 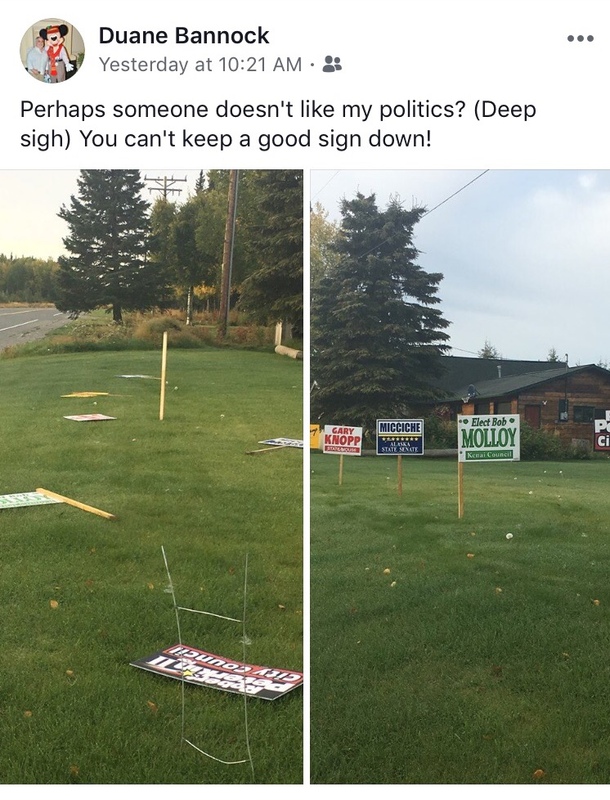 First someone’s ripping down signs. And then there’s this. WOW. 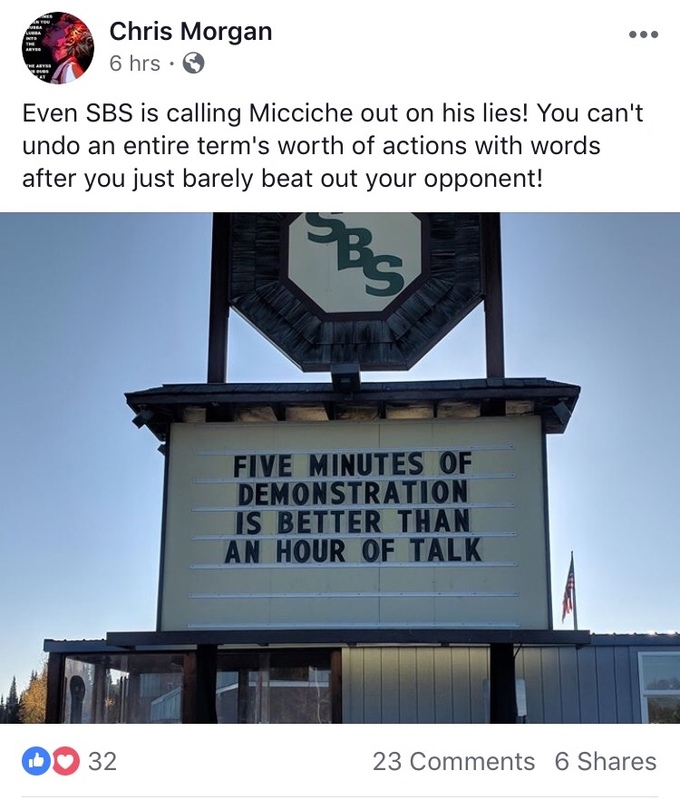 I think Senator Micciche might need to schedule one of his famous listening sessions one-on-one with this guy. 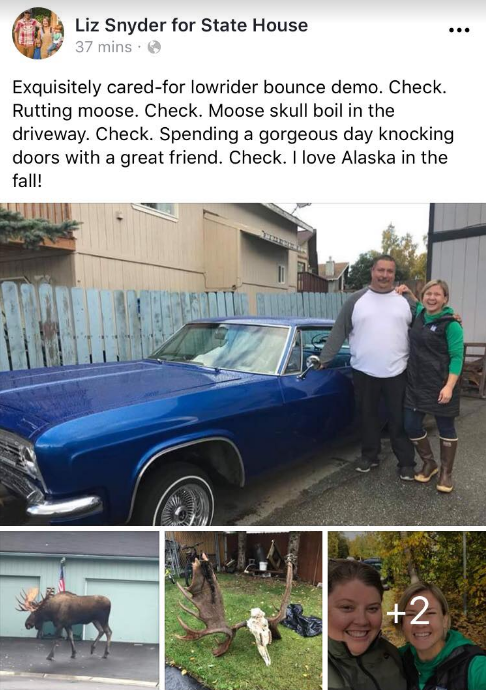 If the hashtags #thatssoanchorage and #straighouttamuldoon had a baby, it would be this post. 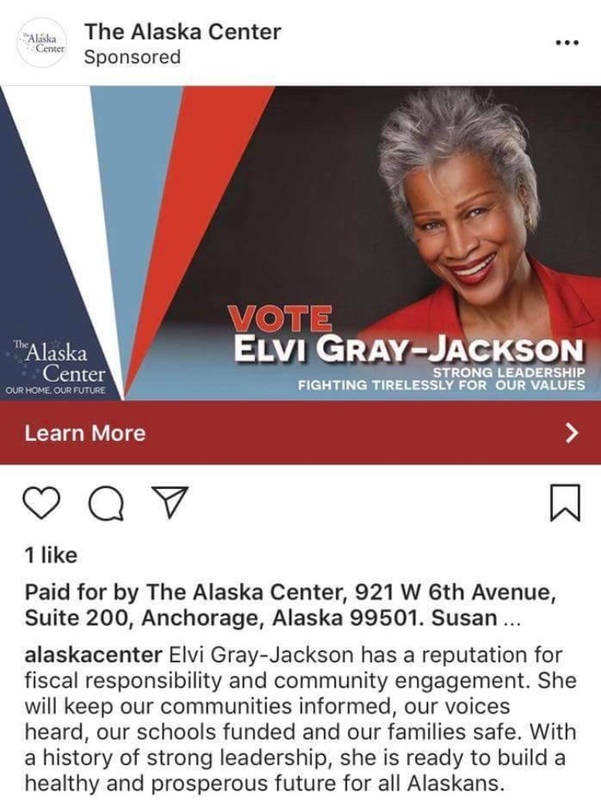 The Alaska Center has been pushing this ad for Elvi Gray-Jackson on social media pretty hard. 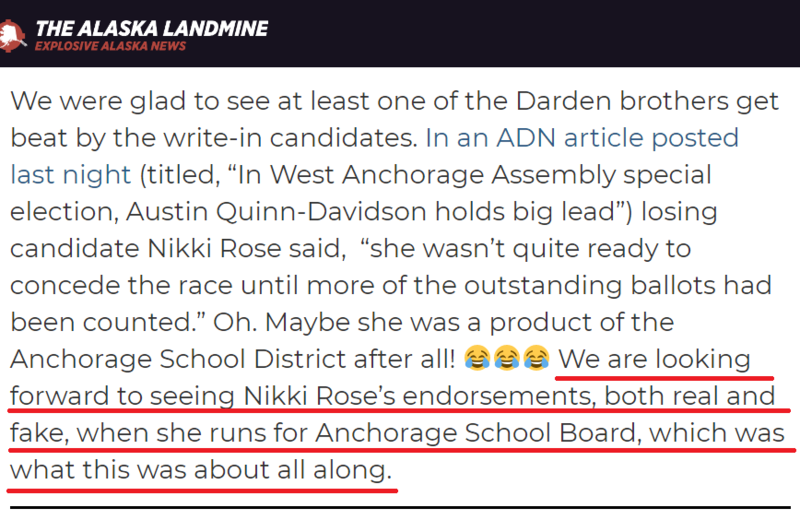 Problem is, the ad doesn’t say what she’s running for. Isn’t that kind of important? For the record, it’s Senate District I. 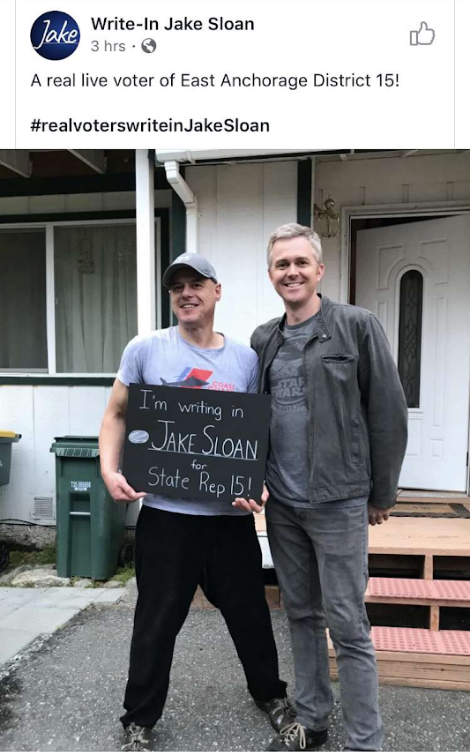 Looks like write-in candidate for house, Jake Sloan, is getting his imperial march on going door-to-door. Something tells me we haven’t heard the last of the “dead voters in District 15” jokes. In case you didn’t know, J-A-K-E S-L-O-A-N volunteers with the 501st Legion and dresses up as Darth Vader for charity events. He has a YouTube channel and everything. If this doesn’t warm your heart, well then you might be one of those deceased D15 voters. Ba-dum ching! 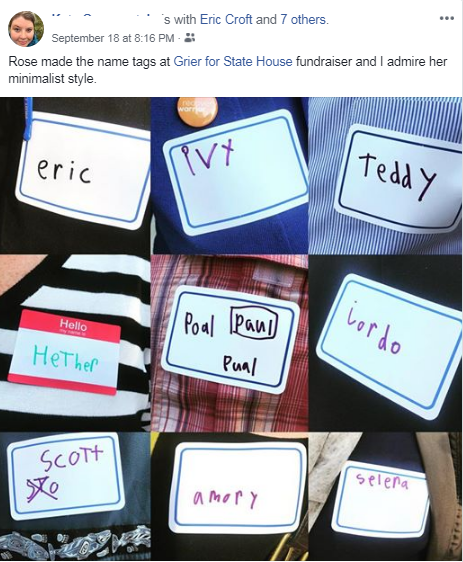 The name tags for candidate Grier Hopkins’ recent fundraiser are even better than his amazing signs. ❤️ This is adorable. Well done, Rose. 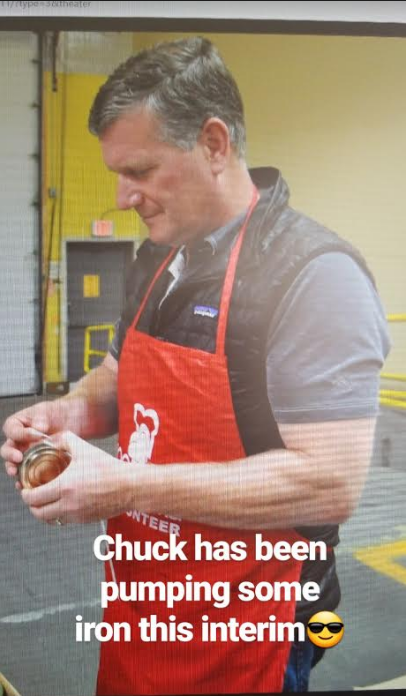 I hope you also received some well earned donations for your hard and inspired work. 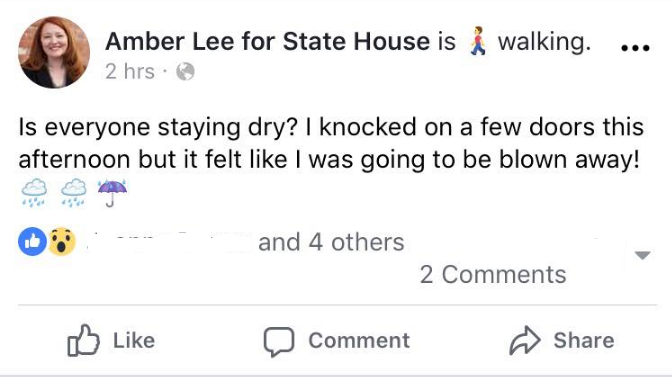 Is there another special session going on?! Looks very swampy. 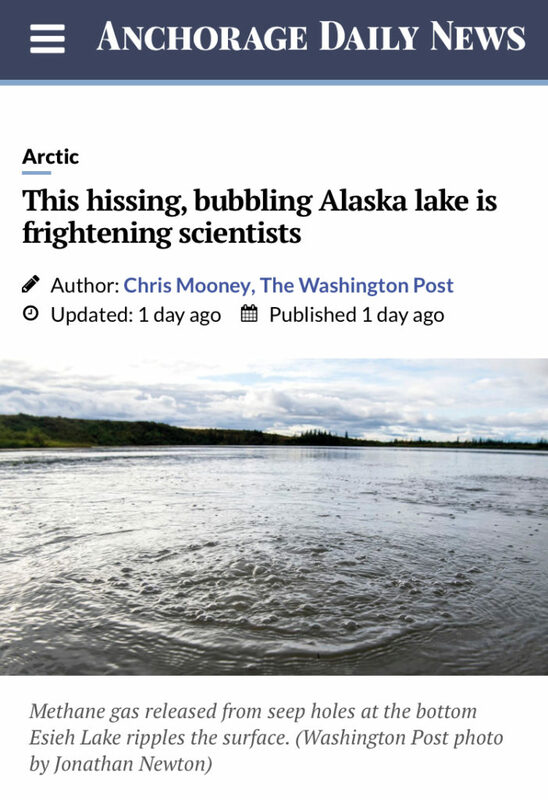 Have they tried draining it? Person B: Maybe it’s questioning. Person C: Yeah, questioning whether it would rather go in my fridge or chest freezer. Ayyyoo. Firefighting spouse of elected official: As a man, when you bad mouth the Bush Company you lose your man card. If you don’t like it, don’t talk about it. What’s the first rule of Fight Club? You don’t talk about Fight Club. Congressional candidate, Alyse Galvin, and her swanky new campaign motorhome plastered with campaign signs. Can someone get us a pic? That will do it for us this week folks. 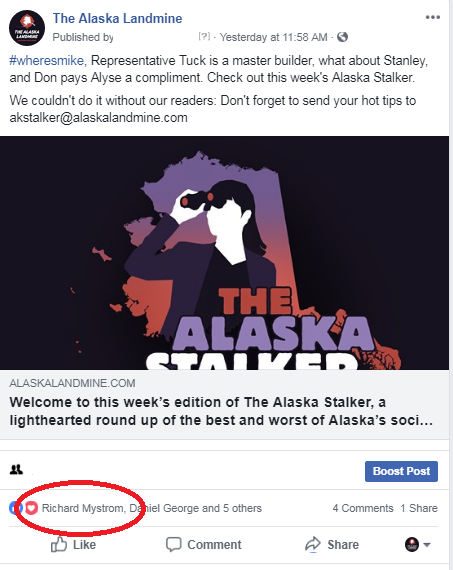 Don’t forget to send your favorite social media and online goofs, gaffs, memes, dust-ups, “Overheard in Alaska,” “Spotted in Alaska,” or whatever else you got to akstalker@alaskalandmine.com Our DMs are always open. Remember: pics or it didn’t happen!